Does your lower back keep you up at night? Try some yoga for lower-back pain — it’s as easy as three gentle poses. The next time your workout routine (or sitting at your desk all day!) causes stress on your lower back, try these specific yoga stretches for lengthening and strengthening. 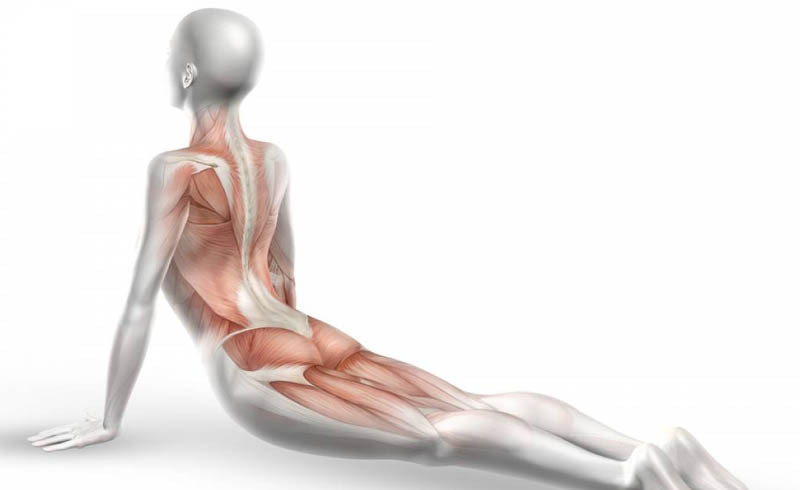 Do these poses for five minutes every day to help release tension and prevent future strain. The candlestick or the shoulder stand is a popular yoga pose that works wonders on your lower back. Start with your back to the mat and feet straight out in front of you. Keep your arms by your sides and pull your legs up to form an “L” or 90-degree angle shape. Continue the stretch by lifting in the hips and bringing the legs up over your head. Concentrate on relaxing the muscles and balancing on the middle of your upper back before the neck. Keep your elbows to the ground but use your hands to brace your hips in the stretch. Hold for stability then continue to push from the core until your legs are as high as they will stretch above your body. With a bend in the legs, release back down to your original start position. Tip: Safety is important with this stretch, so hold with a steady balance to avoid injury. You don’t want your legs to flop forward over your head, as this could cause strain on the neck. There are a few ways to relieve tension in your back, and a twist of the spine may just do the trick. This yoga stretch for sore muscles is a great way to keep proper flexibility and reduce stress on the back. Start by lying flat on your back, and pull one knee up to the chest. Place the same side arm on the floor, and use the opposite arm to add pressure to the knee and allow it to drop to the side. Allow the leg to pull with tension and turn in the back for a relaxing stretch. When you are finished, alternate legs and repeat. Tip: Relax to ease tension in the back, and avoid causing more muscle aches by controlling the depth of the twist with each stretch. Another option is to use both legs to twist. Bring both knees to the chest, and stretch the arms out on either side of the floor for balance. Rock the legs over to one side with a twist by pulling from the core. Hold the stretch and repeat with the opposite side. Some yoga stretches for the lower back provide a simple fix for unwanted tension. If you are having problems relieving these symptoms, try the Bharadvaja’s Twist to pinpoint the problem. Start by sitting on the floor with your feet stretched in front of you. Shift to the left or right by bending the knees to face this side and resituating the hips. Sit tall and take a deep breath to elongate the chest. Exhale as you twist your upper body in the opposite direction as your feet. Keep your bottom to the floor, one hand on the knee and one beside your hip for the best stretch with the twist. Turn the head to complete the stretch and hold. Repeat the stretch by switching to the other side. Tip: Always keep the chest tall and back as straight as possible during this stretch. Make sure your bottom does not lift off the floor during the twist. To deepen the stretch, repeat this technique with a bit of added challenge. Start with one leg straight and sit on the other knee. Bend the extended leg to sit it in the niche (hip flexor) of the bent leg, and repeat the stretch with a deeper pull to relieve tension in the lower back.